Namrata, Former actress, and wife of Tollywood super star Mahesh Babu has met Telangana Panchayat Raj and Rural Development Minister Jupally Krishna Rao today to discuss the development plan of Siddapur village in Mahabubnagar district, which was adopted by Mahesh responding to a request by TS minister KTR. The meeting was held in the presence of Mahabubnagar district collector Sridevi. Namrata has requested for the help of state government to make betterment in the amenities in health and education sectors in the village. Jupally promised to provide all the support needed for the development of Siddapur. 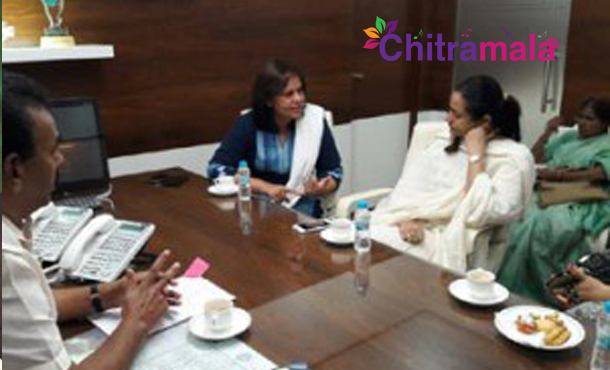 Namrata said that they will soon come up with a detailed plan to make Siddapur a smart village. Few days ago, Namrata visited Siddapur and interacted with the people and received a memorandum about the issues faced by the people of the village.